I need your help with this one. The location depicted in this postcard is a mystery to me. I am hoping that some astute readers can provide me with more information. Some sources believe it was in the area of Pingree Park and the former elementary school on Story Street. 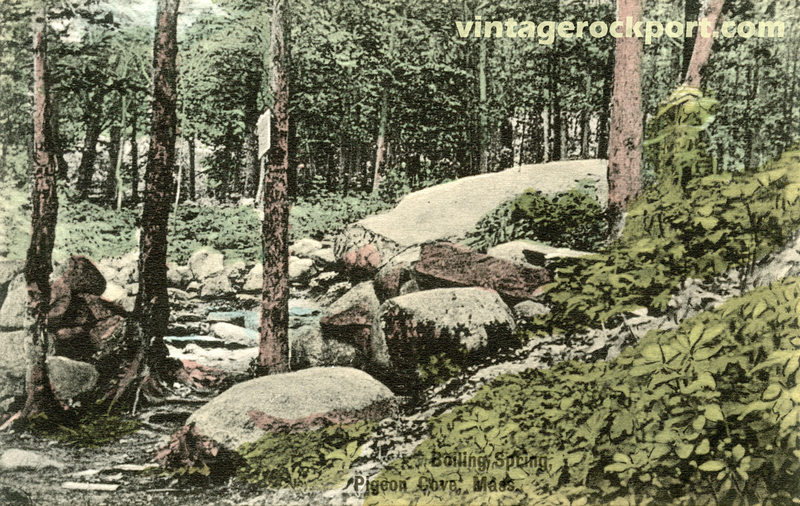 The card is titled, “Boiling Spring, Pigeon Cove, Mass.” There appears to be a sign on the tree, which suggests this was a place people visited. In a discussion of this same postcard at the Cape Ann Online forum, someone suggested that the location might have been somewhere near the former elementary school. I also saw a reference to the Boiling Spring on the blog Memoirs of a Rolling Stone, where the author mentioned that he had been searching for it. In an email exchange, he told me that he never located it with certainty, but he added that someone had given him their “best guess” that it was in back of Pingree Park. The card was published by Charles H. Andrews of Pigeon Cove. I wrote about him in some detail in an earlier post. Andrews was the postmaster in the Cove during the years 1901 to 1917, and possibly longer. This postcard is not dated. It was printed in Germany, which tells us that it was printed sometime prior to 1917, the year the U.S. entered World War I. If you, or someone, could identify that large boulder – if it wasn’t broken up decades ago – perhaps that would be a clue to the location. So many little waterways in Rockport have been sent into culverts, it’s difficult to know where they were. There is something, though, about the configuration of the landscape, that reminds me of the hill behind Evans Field alongside Summit Ave – not in Pigeon Cove, though. It looks like the spring on Phillip’s Ave, across from #31, adjacent to the stone menagerie. My wife says there was once a pump up towards Granite St where people could fill up jugs with spring water.